Salt-affected soils are mostly found in irrigated areas within arid and semi-arid regions where the groundwater table is shallow. Soils of this type have become an increasingly severe problem because they threaten both the environment and the sustainable development of irrigated agriculture. A tool to estimate phreatic evaporation is therefore urgently required to minimize the salinization potential of salt-affected areas. In this context, phreatic evaporation at zero water table depth (E0) is a key parameter for establishing a model for calculating phreatic evaporation. 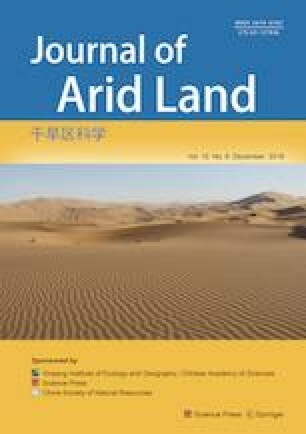 The aim of this study was to explore the law of phreatic evaporation and to develop structurally rational empirical models for calculating phreatic evaporation, based on E0 data of six types of soil (i.e., gravel, fine sand, sandy loam, light loam, medium loam, and heavy loam) observed using the non-weighing lysimeter and water surface evaporation (E601) data observed using a E601 evaporator of same evaporation area with a lysimeter-tube at the groundwater balance station of the Weigan River Management Office in Xinjiang Uygur Autonomous Region, China, during the non-freezing period (April to October) between 1990 and 1994. The relationship between E0 and E601 was analyzed, the relationship between the ratio of E0 to E601 and the mechanical compositions of different soils was presented, and the factors influencing E0 were discussed. The results of this study reveal that E0 is not equal to E601. In fact, only values of the former for fine sand are close to those of the latter. Data also show that E0 values are related to soil texture as well as to potential atmospheric evaporation, the ratio of E0 to E601 and the silt-clay particle content (grain diameter less than 0.02 mm) is negatively exponentially correlated, and that soil thermal capacity plays a key role in phreatic evaporation at E0. The results of this analysis therefore imply that the treatment of zero phreatic depth is an essential requirement when constructing groundwater balance stations to study the law of phreatic evaporation. This study was funded by the National Natural Science Foundation of China (41671032, U1303181), the Key Special Project of National Key Research and Development Program of China (2016YFC0501401), and the National Basic Research Program of China (2013CB429902).